As December of another year squandered in the East loomed, the time came to pursue "rare miles" in a hyper-congested urban corridor. It was my third try at jumping a train this year, including one effort in West Philly, where I spent a couple chilly, darkening hours on a brownfield site a few hundred yards from a freeway overpass. I wasn't going home empty-handed this time, no matter what. Almost immediately, an approaching train presented me with opportunity and a problem. The southbound was coming in at a crawl for a crew change. So I wouldn't have long to wait, as hoboing goes. But the approaching unit, with its million-watt headlights blazing, was only a few hundred yards away. 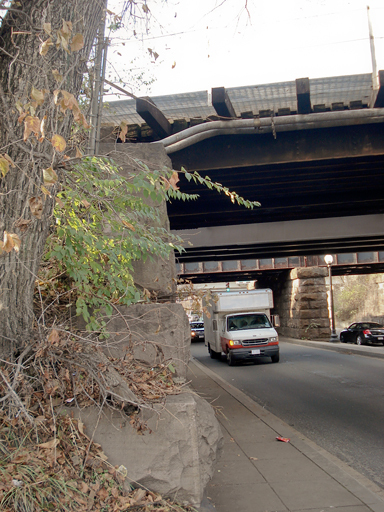 I didn't want to be seen by the hogger, so I was trapped on the less preferable, steeper east embankment below the elevated track. After half a mile or so, the train stopped for its crew change. It sat idle for more than an hour. Meanwhile, junkyard workers beside the train kept feeding cars into an apocalyptic device called the E-Z Crusher, which deserved its own scene in "The Sopranos." I never heard the hiss of the units abandoning us, so I knew the departure would occur sooner or later. 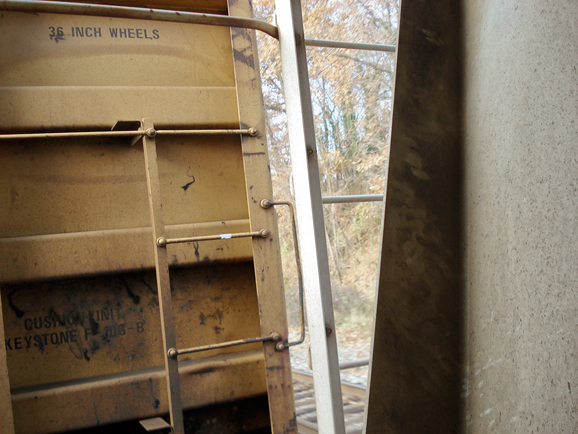 The train's standstill enabled me to switch to the cubbyhole of a grainer, the best place to stay out of sight. Once the train came back to life, it took a long, long time to break out of town. It worked its way through an aged industrial landscape that I didn't know at all. As long as I stayed inside my cramped cubbyhole, the legions of would-be informants at every crossing or idle commuter platform couldn't see me. But staying in there for the duration meant I'd view only snatches of countryside between my car and the next car. It wasn't a Western realm of splendor, but I was glad simply to complete my self-imposed assignment of riding a freight before the year ended. Probably the most memorable part was Jessup, which had both a max security prison and a yard. The freight eventually accelerated into PG County and on into DC. I had ended up in the same part of town where I'd bailed 13 years ago on an even shorter ride. Later, I realized that both trains must have stopped to work at Benning Yard in SE DC. In 2001, I had gone over the barbed wire with much clanging and rattling, but this time I sought a less attention-grabbing exit. I kept moving until I found a staircase-like structure providing an easy descent to the street. Less than a mile away, I rejoined the legal world by catching the Orange Line out of Deanwood. It was past 230 pm; the freight had taken 2 h 45 m to go 41 miles. Keep offering service like this, and people are going to take passenger trains!